As alter egos go, you couldn't have two more opposite types than the adorable Sven and the relentlessly fierce ice monster. Sven is a reindeer. Introduced at the start of Frozen, he's pretty much the perfect anti-Disney star: he doesn't sing or dance, though he does mug some. He doesn't even speak. Rather, he has his lines read for him, or imagined for him, by his best friend, Kristoff (Jonathan Groff), a strapping Nordic sort of young man who sells ice for a living and has been raised by a community of trolls who disguise themselves as rocks. In other words, there are good reasons for Kristoff to need a best friend, even if he does need to project at least a little of that that best-friendness. Sven and Kristoff live a routine life, locating, chopping, and collecting ice blocks to sell in Arendelle, a land of fjords and long, warm summers. This changes when Arendelle is lunged into an endless winter -- frozen, as the movie's title indicates. At this point, Sven and Kristoff are plunged into their own version of winter, unable to make a living. That endless winter comes courtesy of Elsa (Idina Menzel), queen of Arendelle. She doesn't mean to destroy her kingdom's economy, exactly, but she has her reasons. 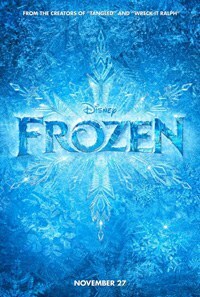 These form the bulk of the first third of Frozen, which lays out the following: as young children, Elsa and her younger sister Anna (Kristen Bell) share a secret, namely, that Elsa has the power to make snow and ice. Just why or how she came by this power is unclear, though both their parents are aware of it, and only caution Elsa to be careful. She is indeed careful, until she isn't, and one night she zaps Anna with a cold blast to the head that threatens her very life. Anna's survival comes courtesy of some trolls her dad knows (those same trolls who raise Kristoff; apparently they have little else to do but help out hapless humans), and it is costly: Anna must forget that her sister has a secret power and so join the rest of the population who has no idea of it; to this end, their parents separate the girls, locking Elsa away in a room with a very large wooden door through which the sisters sing longingly, each wanting to see the other and both miserable. When the girls lose their parents in a terrible accident, they remain separated until the night when Elsa "comes of age" and is destined to be crowned queen. The ceremony doesn't go quite as it's supposed to, and soon enough, the teenagers are separated again, this time because Elsa flees town, embarrassed and hurt when an accidental display of her icy gift makes everyone afraid of her. That, and, she leaves the entire kingdom engulfed in that endless winter. Everyone, that is, except Anna, who leaves the kingdom in the charge of the visiting Prince Hans (Santino Fontana), and determines to find Elsa despite the cold, the darkness, and the loss of her horse (who runs off when she falls off). She needs help and gets some, from a sidekick of a snowman named Olaf (Josh Gad) and Kristoff. An exceptionally handsome and big-hearted ice salesman, Kristoff is travelling with his best friend, a reindeer named Sven. With his sales down owing to the endless winter, Kristoff sees a particular benefit in aiding the princess, though he also immediately worries for he, and makes her safety his top priority, making clear to everyone but Anna and himself that he's in love with her. As this frankly charming romance develops, mostly by a series of near-crises and escapades, Anna and Kristoff both find in themselves and each other a kind of loyalty and generosity they hadn't imagined before, being teenagers. That Anna is dedicated to saving her sister is a starting point, that all three come to see the value of love in all its forms -- familial, romantic, and best-friendy -- makes this fairy tale at least a little unconventional, if not precisely fractured. At least part of this unconventionality emerges in the movie's several coming out stories. Elsa's primary directive from her well-meaning father -- that she must “Conceal it, don’t feel it" -- lays out this theme early on. As much as she is literally closeted throughout the first part of Frozen, her initial self-expressions, alone in the icy woods in an ice palace she devises out of air, are fabulous in most every way: her hair comes loose, her gown turns sensational, and her singing voice, previously quietly harmonious, booms. She's a girl as a drag queen, a point underlined in a peculiar way by her creation of a gigantic ice monster with icy talons and fangs to scare off her sister. As an embodiment of Elsa's rage and outrage, the monster is loud and menacing, in need of rather severe repression and eventual dispatch. As alter egos go, you couldn't have two more opposite types than the adorable Sven and the relentlessly fierce ice monster. But they serve similar purposes for the two individuals Anna comes to embrace, to protect, and to celebrate.